It’s 6:00 PM, about a week before Christmas 1975, and 8 year old S. Blue is under the Christmas tree with his Matchbox cars. And I mean under the tree. There I am. Behind a few early-arrived packages, those are my pair of sock feet sticking out with a bit of tinsel looped around. You see, under the tree is a great place to soak in as much Christmas as possible, sort of like a Christmas tanning bed. The multi-colored lights glow together to produce a luminescence the quality of which exists at no other time of year and in no greater quanity than here, and I am determined to absorb the maximum amount of color and taste and sound and smell of Christmas. It suddenly occurs to me that mom is busy in the kitchen and no one else is around. I belly crawl out from under the tree and sneak upstairs to do a little snooping. The door to mom and dad’s room is closed and it squeaks like crazy, so I go around to the bathroom closet. There is a back door that opens to my destination. As I inch my way in, the dark bedroom looks like a north pole tornado. Giant coils of red, green, and white ribbon lay partially unwound on the bed. Tall rolls of wrapping paper with Santa Claus, and snowflakes, and ornaments, and candy canes drunkenly hold each other up in the corner. There’s an unfamiliar pair of sharp-looking scissors, not the old red pair from the junk drawer in the kitchen that don’t really scissor as much as gnaw. And stacked half as tall as the ceiling is a pile of Christmas presents, dozens of mysterious shapes wrapped in brightly colored paper, big enough that if I climbed up I could almost touch the ceiling. I’m becoming acutely aware of the amount of time I’ve been off-radar, so I reluctantly but excitedly tip-toe back through the closet and downstairs. In the living room again, I jump onto the big couch under the picture window. My cars are still under the tree. A traffic jam caused by a Lego robot. On the TV, Gilligan thinks he’s a vampire. Outside on our front porch, the big C9 Christmas lights glow brightly. Mr. Sorgel’s all-blue display across the street shines coldly, and two houses down on the Klotz’s front porch an aluminum tree changes colors – blue, purple, red, orange, yellow. Windows, doors, and porches twinkle in electric glory all up and down Elm Street. Chicken and gravy smells waft in from the kitchen. I slide back under the Christmas tree with my cars and legos. It was a cold, damp evening. Thick fog poured from deep woods and out of culvert pipes to cover yards and driveways in our subdivision, mailboxes transformed into mute sentries along the sides of the road. For the first week of December, the scene was more reminiscent of The Legend of Sleepy Hollow than It’s a Wonderful Life, but weather in the Ohio Valley is like Russian roullette with a Gatling gun. Tornadoes or ice storms. I’d just be happy with a good 4-6 inches of snow and strains of Belavia on the news at 11:00 while they scroll the list of school closings. Anyway, it was a dark and foggy night, and our neighbor clanged up and down an aluminum extension ladder, a miniature lighthouse unto himself lit by the many strands of lights draped around his neck. He was in the process of wiring a 30′ Christmas tree. More accurately, he was hanging long strands of C9 lights from the chimney in the shape of a tree. 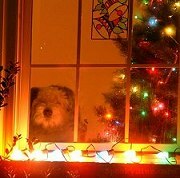 C9 bulbs are those great big lights that look great on a house, but are the most evil of all Christmas light types. The C9 bulb is uniquely designed to explode upon the slightest impact with any other object, but most often with each other. You’ll need leather gloves and a pair of pliers to remove the electrified, jagged glass blossom left behind. These things will go out just to trick you into tightening the bulb. That’s when you’re most likely to end up with a handful of colorful broken glass. He was too far away and high up to notice me as I ambled past, a shadowy wake cutting through the mist, intent on getting its lap around the subdivision in before The Simpsons came on at 7:00. So he didn’t know he was being scrutinzed. All the hallmarks of a holiday tragedy were in play. Slippery, wet, electrically conductive ladder – check. Darkness – check. Christmas light noose – check. I kept going. God help me, but I just kept going. If the Christmas lights were going to attack, they would have done it by the time I came strolling by, so everything turned out fine in the long run. However, I think that the pact, whatever it was, into which he and those C9s had entered has ended. Or relations are strained. Last night as I hurried past his house (and I do mean hurried because the coyotes were on the prowl and despite the confidence lent by hefting a not inconsequential Maglite, I wasn’t at all convinced that they wouldn’t come down off the ridge and feast on me at any moment, 17 pound flashlight in hand or not), I noticed that a handful of lights up at the very apex of his tree were out. This was an outright invitation to destruction, but would he take the bait? We’ll have to wait and see. One of life’s truths is that one’s dedication to an ideal is reflected in the complexity of one’s Christmas light display. This is completely unfair, of course. Who’s to say that the house with 50,000 lights, a penguin army, and Santa flying a helicopter across the front yard harbors more Christmas spirit than that house with the single strand of mini lights tossed haphazardly over the bushes? It’s not a question of spirit, really, but another compulsion altogether. Or mania. It is also a truth of life that Christmas lights are dangerous and will try to kill you. They’re not content to simply hang from your gutters. One or two lights on the highest gable will conspire to go out right after you put away your extension ladder. Going back up that ladder is the equivalent of investigating an odd moaning noise at the back door during a zombie outbreak. It’s a ruse. Leave it be. 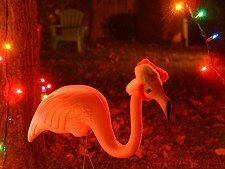 Better to pursue your ideal by focusing on other things like making little Santa hats to put on all your lawn flamingos.